During the Streets of Paris workshop in September, an assignment was to shoot on the Pont des Arts. There were a number of musicians playing on the bridge, but the lone saxophone player caught my ear. I stopped to listen to his music for a long time, struck by the fact that he seemed to be playing for himself, not the people around him. 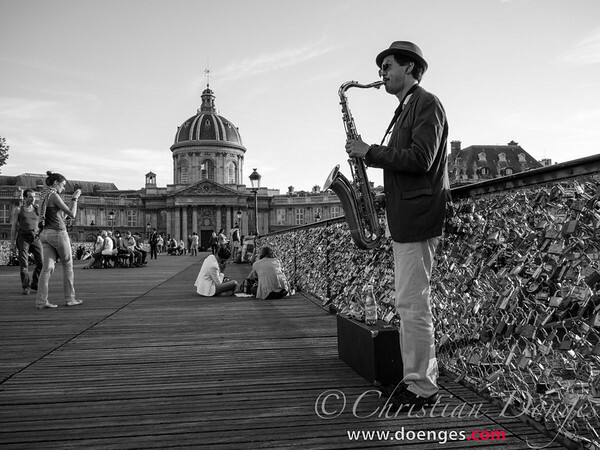 Stephen plays the Saxophone on the Pont des Arts in Paris. Afterwards, I talked to Stephen, the musician, who turns out to be a really nice guy. He’s originally from Pittsburgh, PA and went to live and work in Paris. After a while, he could not stand his “normal” job anymore, so he is now a full-time musician. Wow, talk about living your dream! At the time, he was practicing, which he prefers to do outside and in public, rather than in a stuffy rehearsal room. That I can relate to! 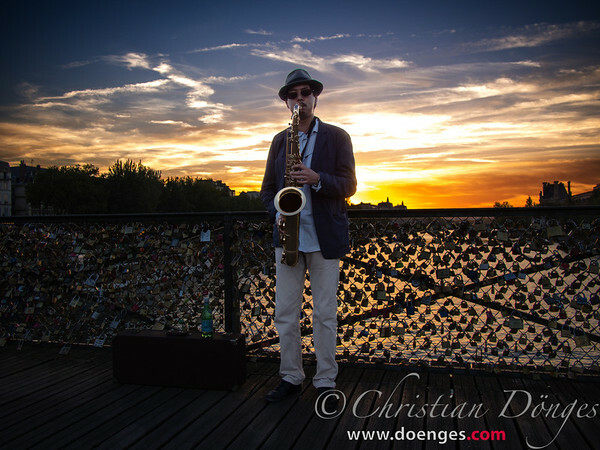 Stephen plays the Saxophone in front of the sunset on the Pont des Arts in Paris. Next time you are in Paris, check out Stephens schedule and listen to him play! And if you’re in Munich, Stephen, let me know. Lovely photo shoot in September, Christian! Is the Eiffel Tower behind Stephen? Thank you. Yes, the Eiffel Tower was behind Stephens back.